The topic of Value Added Tax has always evaded the BAR. But there are certain things about VAT that are good to know like the new law on E-VAT or RA 9337. - sale of residential lot valued at more that P1.5 M.
- lease of residential unit with a monthly rental of more than P10,000. For the year 2005, the rate remains at 10% but it maybe increased to 12% starting year 2006 when certain conditions are met. 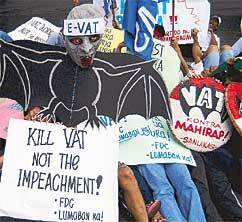 Sale of goods and services to government is subject to 10% VAT under the Tax Code. Further, before making payments to suppliers, government agencies acting as withholding agents are required to deduct and withhold a final VAT due at the rate of 5% of the gross payments thereof. This act was implemented on November 1, 2005. I find the subject of taxation the hardest so i will appreciate it if u post more on this topic.